Willie Hamilton from SWEEP answers a question at Councilwoman Bass’ community town hall meeting for the 8th District last night. A few residents came out to tell local government agencies and Councilwoman Cindy Bass the community issues they are facing and Pastor Alex Velazquez was given a citation award. 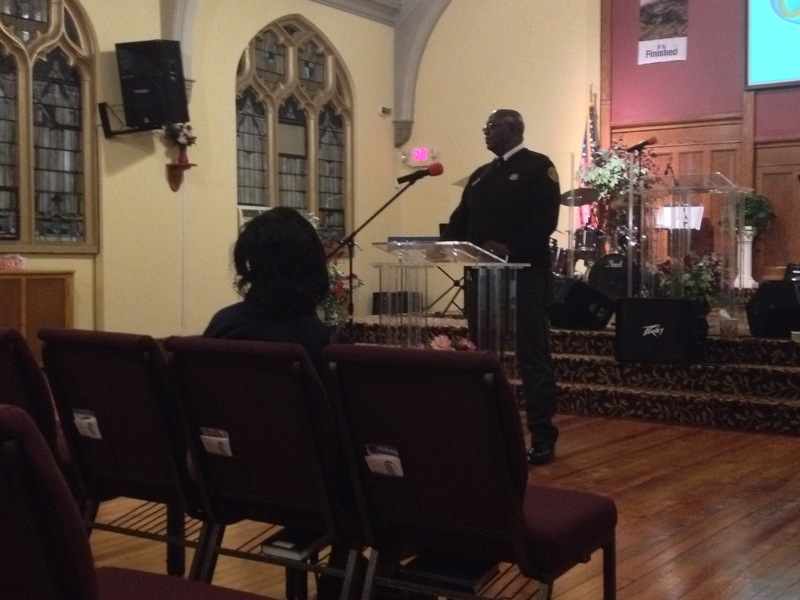 Last night, around 14 concerned residents trickled into the Oasis City Church at 5248 N. 5th St. for Councilwoman Bass’ town house meeting. Local government agencies and the councilwoman all stressed that they were open to hearing any concerns and solving issues. The captain of the 35th District Derrick Wood was first up at the podium. The captain said he was encouraged by the growing turn out at the police meetings and that he was “looking to engage the community” and that the relationship between residents and the police needs to have trust. No questions were addressed to Captain Wood but you can speak to the captain and the officers of the 35th District at the captain’s town hall meeting on Nov. 16th at 6301 Old York Road or at a PSA or community meeting. A representative from License and Inspections (L&I) stressed that everyone have at least one fire alarm per floor and a carbon monoxide detector near every sleeping area, especially during the winter months when heaters are used more often. 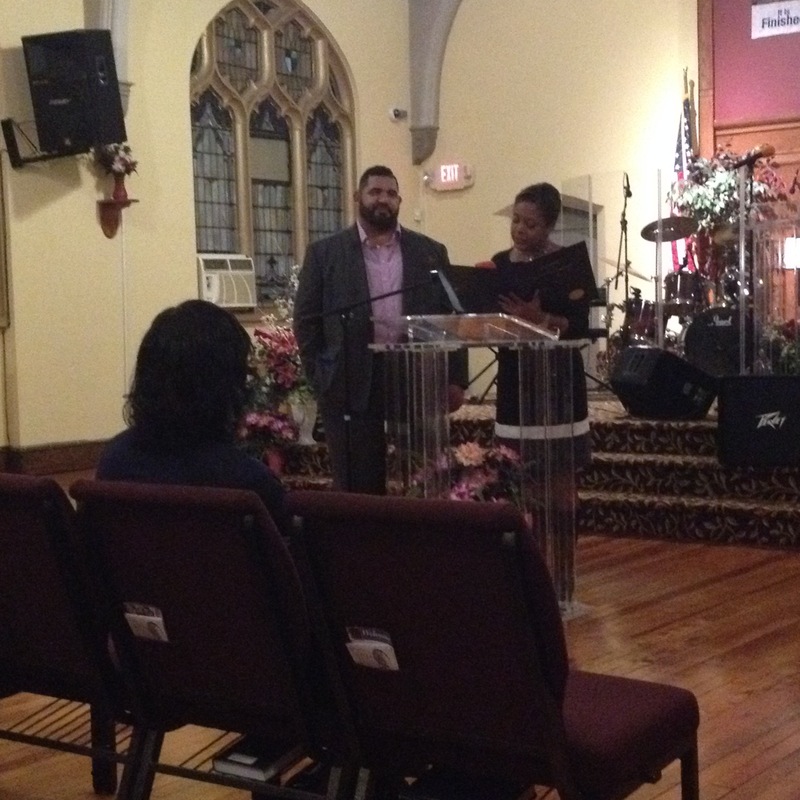 Councilwoman Bass gives an award to Pastor Alex of Oasis City Church in Olney. Representatives from Community Life Improvement Program (CLIP), Philadelphia More Beautiful Committee and Streets and Walkways Education and Enforcement Program (SWEEP) spoke about the city programs they work for and offered their assistance in helping residents. 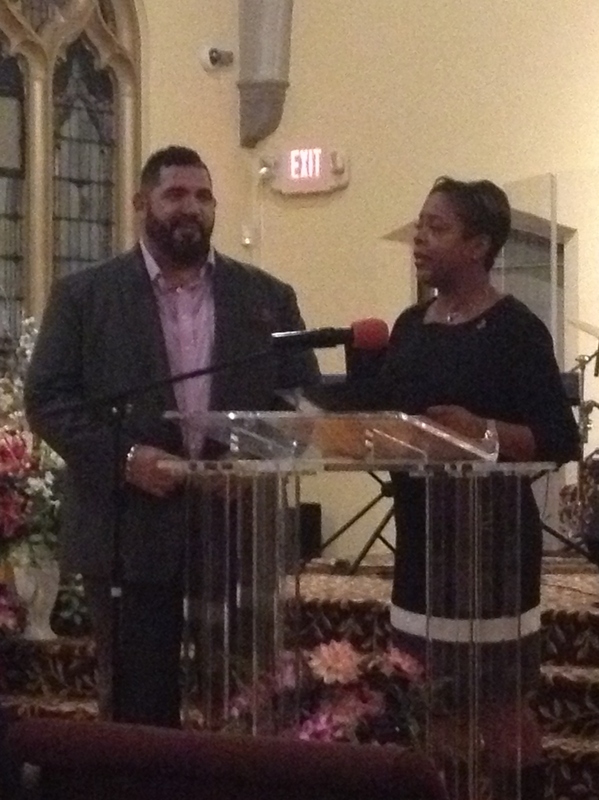 Councilwoman Bass spoke last and presented Oasis City Church’s Pastor Velazquez with a citation award for outstanding faith-based programs. The citation was signed by City Council President Darrell Clarke and Bass and Pastor Velazquez was given a long applause from the crowd. Bass said her office has plans to improve Barrett Playground at 641 Lindley Ave. with adult fitness equipment, play areas for kids with developmental delays and to improve the overall facility. Bass also mentioned that she wanted to bring summer events such as Oldies in the Park, Jazz in the Park and movie nights to the Logan/Olney area of District 8. “Whatever we do in this neighborhood, we draw people out,” said Bass about those events that attract 200 to 300 people. She said those events show community involvement and is a welcoming sign to possible developers to invest money in the Logan and Olney area. Bass also said she wanted to create a monthly community caucus for members of the neighborhoods to sit and talk about issues ranging from drug houses, abandoned homes and the families that need extra help. Bass was asked about the lack of home construction in Olney and if her office could help with tax breaks or union help to bring land development. “No imminent things you can do,” answered Bass. “You can entice them by showing unity.” She mentioned the Logan Triangle as being a possible jump off to bringing more property development to the area. Bass said the development would “hopefully” happen, but that the caucus should unify neighborhoods before developers.